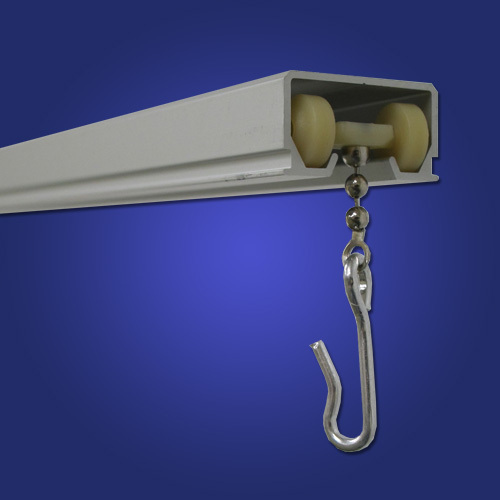 Custom Hospital and Cubicle Tracks include 2.2 Carriers/Hooks per foot. Comes complete with Track, Carriers, Connectors and End Caps. Easy Cut to Size Track, Commercial Grade, Made in the USA. Ceiling Mount. Ideal for Hospitals, Offices, Labs, Physical Therapy areas and Homes. In-Stock for Immediate Delivery. Order Online or call for Live Expert Help. In addition to standard kits, Custom configurations are always available. Bends are available in 45° & 90° Only. Curves are based on 12" Radius. For custom quotes (Our Specialty!) simply print out the measure form located on this page and fax it to the number provided. Or just call us directly. We specialize in Custom Curtain Tracks. Design your own at our Custom Curtain Track page or call us at 1-800-791-2946. Architect specified Cubicle Curtain Track for Hospitals, Exam Rooms, and Professional Use. Extruded Aluminum track: 1-3/8" wide x 3/4" high by .058 wall thickness. Ideal for use in: Hospitals, Physical Therapy areas, Dressing Rooms, Boats, General Privacy Areas, As well as for Whirlpool tubs, Oversized showers, other Home use. Kit 1: 4'0" straight. Consists of one 4'0" straight track, 1 pair of endstops, and 13 carriers. Satin Anodized Finish. Kit 2: 6'0" straight. Consists of one 6'0" straight track, 1 pair of endstops, and 17 carriers. Satin Anodized Finish. Kit 3: 8'0" straight. Consists of one 8'0" straight track, 1 pair of endstops, and 20 carriers. Satin Anodized Finish. Kit 4: 8'0" x 8'0", 90° bend. Consists of one 2'6" x 2'6" 90 degree corner, two 5'6\" straight tracks, two splices, 1 pair of endstops, and 40 carriers. Satin Anodized Finish. We specialize in Custom Curtain Tracks. Design your own at our Custom Curtain Track page. Brand: Imperial Fastener Company, Inc. This item ships Small Package Ground, which means it will be delivered by UPS, FEDEX, DHL or USPS. If you require expedited shipping, please request a quote after adding this item to the cart and note in the comments area that you require expedited shipping. A Customer Service Representative will provide you with a detailed quote including pricing for the expedited shipping. We do not require an adult signature for deliveries, but please note that the decision to leave your package without a signature is at the discretion of the delivery person. If you want an item left at your doorstep, the best thing to do is leave a note on your door asking the driver to leave your package with "No Signature Required." Be sure to include your name and tracking number (if available) on the note. If you have any questions or would like to speak to a Customer Service Representative about your order, or require services beyond expedited shipping, please call 1-800-791-2946.